Arthur Streeton’s The Bay from Olinda Top, 1925, was first exhibited and purchased from the Fine Art Galleries, Melbourne, in October 1925. It was one of a number of works from that exhibition singled out by contemporary critics for their perceived ‘freshness’ and the ‘arresting’ nature of their compositions.1 These exquisite paintings that featured panoramic views to and from the Dandenong Ranges, near Melbourne, are tightly held and rarely come on to the market. Streeton’s glowing assessment of Olinda and his desire to put down firm roots there did not take long to realise. Following his return from a final overseas trip in 1923 and the sale of Golden Summer, Eaglemont for 1000 guineas in 1924, Streeton had the means to commission an architect to design and build a new house and studio. He subsequently divided time between his Melbourne home at Toorak and ‘Longacres’, Olinda. Over the next decade and a half he capitalised on this picturesque location by capturing the panoramic views, magnificent stands of trees and intimate, hidden pockets of nature. He also painted the flowers and shrubs that he cultivated in his garden. The Bay from Olinda Top was painted close to the Streetons’ property at 15 Range Road and features the characteristic rolling hills, pockets of bush and open paddocks of that area. The distant view looks in a westerly direction, possibly toward Frankston. The combination of a hazy background that contained snippets of water at Port Philip, Westernport and the nearby Silvan Dam became a favourite motif for Streeton. These feature in the related Westernport Bay from Olinda 1925 (private collection) and The Vanishing Forest 1934 (private collection), one of the most important paintings of his last decade. Streeton was a master of execution, combining what one contemporary critic characterised as ‘vigour of brushwork and richness of colour’. The Bay from Olinda Top was no exception. The density of the brushwork seen in the clouds and the clearly articulated fore, middle and background show how Streeton’s painting style had changed from the early Impressionist underpinnings of his work toward what Marguerite Brown aptly describes in a 2015 Menzies essay as ‘a more defined observation of nature’. Moreover, Streeton was thinking of how his works related to one another, utilising colour schemes of rose, golden yellow and different hues of green, and subjects that had clear links to one another. 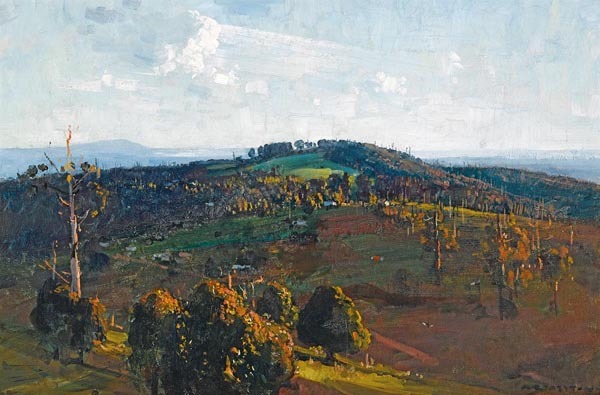 Contemporary reviews suggest that The Bay from Olinda Top was probably exhibited alongside the slightly larger, though tonally similar, The Valley from Olinda Top (1925) from the National Gallery of Victoria, which was also purchased from the 1925 exhibition. Of the young men and women who took Australian art by storm in the 1880s and 1890s, Arthur Streeton stands out for his talent, dedication and longevity. His paintings of the Australian landscape underwent important stylistic shifts from their early beginnings up until his death in 1943, however the central premise remained that of conveying the variety and nuances of nature.